ENCRYPTED was founded by Sacrificulus (vocals/guitars) and T.666 (drums) in autumn 2012 in North Rhine Westphalia and so the band is part of the NRW Death Metal community. The original idea was to create a raw old school black/death metal sound. After one year of practicing and composing three songs, the band recruited a bass player. With JJ Allin on bass guitar, ENCRYPTED recorded the debut demo in their rehearsal room. The result was a very loud, dirty and raw sounding three track 100% DIY demo tape (limited to 50 copies). After the tape was sold out the band worked on new material for an EP. In the course of 2015 JJ Allin left the band for personal reasons. So ENCRYPTED returned to the original two piece constellation. The new songs are more in the vein of the last song of the demo "Curse You" which is pure Death Metal. Since then the band has found their home in the Death Metal genre. 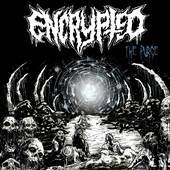 The sound of ENCRYPTED is inspired by Scandinavian and US Death Metal. This is the sound which the band enjoys listening to. Lyrically ENCRYPTED deals with subjects like doomsday and the life beyond. In 2015 four new songs were written and ENCRYPTED entered the DPK-Studios in Dusseldorf to record a four song EP. After recording, mixing and mastering were done the guys were looking for a suitable label to release the EP. So the band joined forces with STAR SPAWN SOCIETY. 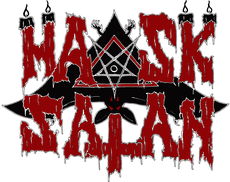 In Finland, in February 2015 MASK OF SATAN was founded by three individuals who already shared the same bands but wanted to create something more. The idea for a Death Metal band was generated through old horror movies and common interest in gore. 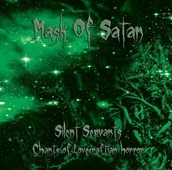 You can hear influences such as Six Feet Under, The Grotesquery and Necrophagia in MASK OF SATAN’s music. Overall idea was to keep it simple and old-school and to be able to play as a trio. The name Mask of Satan comes from an old Italian horror movie “La machera del Demonio” (1960), which translates as Mask Of Satan. The concept of a H. P. Lovecraft lyrical theme album came up in 2016 and has proven to be a great inspirational source for MASK OF SATAN. Naturally biblical interest for Lovecraft's work was already there, lurking in the subconscious mind! MASK OF SATAN stands as a proud continuation of Horror and Gore and with a unique style delivers terror to mortals! In March 2016 the Chilean Death Metal horde was founded by Pablo “Carcelero” Ñanculao (guitars, vocals) and Rodrigo “Pilatvs” Marmolejo (drums). Both were former members (approximately for 15 years) of the well-known Death Metal band DIABOLICAL MESSIAH. Later in 2016 Marcelo “Nunviolator” Herrera (bass, lead vocals) from the Death Metal band MALFAS and in 2017 Jaime “Pacto” Vásquez (guitars) from the Death Metal band IMPRECATORY joined the unholy force. 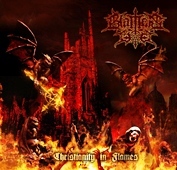 BLAMES GOD is a brutal, blasphemous and anti-Christian Death Metal band influenced by, among others, bands such as HATE ETERNAL, MORBID ANGEL, KRISIUN, ANGEL CORPSE. In September 2016 BLAMES GOD released a first promo CDR with two tracks, which was a preview of what will be the first demo “Christianity In Flames”. In 2017 the band joined forces with STAR SPAWN SOCIETY from Germany and “Christianity In Flames” will be officially released during the second semester of 2017. 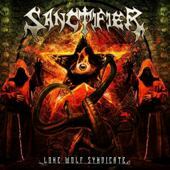 SANCTIFIER is an unholy veteran Death Metal band from Natal/Brazil, founded in 1990 by Alexandre Emerson and Victor Fábio. The Cthulhu worshippers recorded several rehearsal / demo tapes and a live tape between 1991 and 1993. From 1993 until 1997 the band changed their name to HELLSPAWN due some ideological difference within the band members. In 1997 the band was laid to rest because of line up problems. Three years later, in 2000 Alexandre Emerson started to compose new songs for SANCTIFIER and in 2003 a new demo saw the light of day. In the following years the band released some more demos, its debut full-length album called “Awakened By Impurity Rites”, some compilations, a split with their unholy brothers from HEADHUNTER D.C. and the second full-length “Daemoncraft”. Then the band had to face line up problems again but still was able to play many live shows and Alexandre started the song-writing process for the band’s third full-length album. Now “Lone Wolf Syndicate” will be released in South America via Rising Records and in Europe / rest of the world via Star Spawn Society. “Lone Wolf Syndicate” contains twelve brutal and unholy hymns created in the most morbid and deepest Death Metal abyss. This album has an eerie, dark atmosphere and represents all periods of the bands long and varied history in underground and surely will be called the bands most intense, dark and wicked work so far.